What My Mother Taught Me about___________________. “How are you?” asked the grocery clerk as she took my Dillon’s card, cloth bags, then came around to scan two bags of cat food and a bag of litter. “I’m fine. How are you?” I answered, trying to dislodge a bottle of generic aspirin from under some organic oranges that were on sale. .
As I continued stacking up the items on the moving belt, wondering why I gave in to my just-home-from-college-for-the-summer-daughter’s demand for flavored water, something a friend recently told me came to mind. Her cousin’s wife was checking out when she realized that the woman behind the counter, asking her how she was, had no idea that her husband had just committed suicide. And then it suddenly struck her that she also had no idea what this other woman might be going through. My mother was a friend to all our neighbors. Everyone knew Louise and could see her many a morning walking briskly to a garage sale. 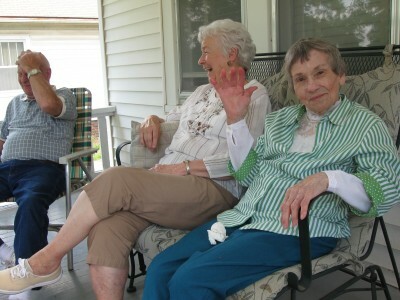 She liked to sit on the porch in the afternoon and watch the school children at recess across the street from our house. In the evening, she’d be out again, this time welcoming anyone who came along to join her for a chat. She was easy to like and liked everyone in return, even those neighbors who were not so likeable. One such person was Florence who lived next door. She tended to keep her blinds closed, even during the day, and seldom was seen outside except to get in or out of her car. When the school children hit a ball into her yard, they weren’t sure they wanted to retrieve it from “that cranky old lady’s place”. But my mother believed there weren’t any people alive who didn’t have some good in them and the trick was to find it. She made a point to say hello whenever Florence ventured out and then began giving her applesauce bread or a piece of homemade pie. Gradually Florence began to change. I’d hear a hesitant knock on the door and she’d be standing there, a plate of peanut butter cookies in her hand. And she’d surprise me by waving from her backyard, where she was planting vegetables. As her garden grew, she started to walk across the driveway to discuss with my dad the progress of their tomatoes. Florence gradually confided in my mother about her life. How her father beat her with a horse whip. How her mother told her she had never wanted another child after the favored older sister was born. How she always felt unattractive and unwanted. How she never made close friends, had never married. She had accepted a life with few pleasures, spent alone, from an early age. Knowing this, my mother made a point to tell her she looked nice in the color blue or that she must have a green thumb by the way her okra was already so tall. Florence didn’t completely get over her difficult ways, but she started to talk with other neighbors and even sat out on her front porch on summer evenings. Sometimes her old habit of being cold and harsh came out and my mother would distance herself for a short time. But in a couple of days, Florence appeared back at our door, with a plate of fudge or a bag of ripe peppers. No apologies or explanations were ever given or needed. “She’s had a hard life,” my mother would say. “I think she’s doing the best she can.” And I came to understand that the best she could do seemed to be a lot better with the help of a neighbor who had the understanding and willingness to see beyond the surface. We don’t know what’s behind the face of that Dillon’s clerk. Maybe she is waiting for the results of a scan for a just discovered tumor. Or maybe she just found out that her husband wants a divorce. That she may have to take out a third job. As my mother would tell me, you just don’t know. All you do know is that there is someone behind those eyes, behind the mandatory “How are you?” with a story to tell. I had a very similar experience in a grocery store a week or two after my nephew Mike was killed at the age of 19. The “sacker”, a gentleman in his early seventies asked me so sincerely how i was doing. I found myself giving him an honest answer and explaining some of the still fresh pain our family was working through. It made me think too, about those strangers through the day that i make conversation with. Your mom was so right. One never knows. We can all help someone along by a simple smile. Thanks for the essay. Enjoyed it! !